Here are a few of the things I bought this week. 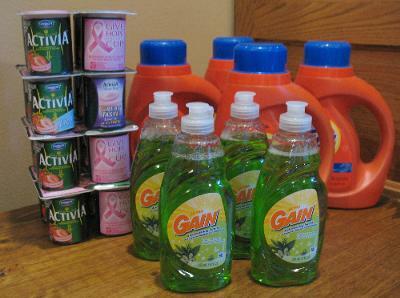 The Gain dish washing soap was free. $3.49 Tide 2x Ultra 50 oz. on sale at Maceys for $4.99. Priced matched at Wal-Mart so I didn't need to go to two stores. I used the coupon and got them for $3.49. $0.79 Dannon Activia, 4, 8 or 12 pk or 24 oz, $1/1 (9-12-10) SS-8/8. It's on sale at Maceys for $1.79. I price matched at Wal-Mart. Final price was $0.79.